Castile Restaurant shines with a new chef and menu, raising the bar for dining on St. Pete Beach. Located in the Kimpton Zamora Hotel, Castile Restaurant & Rooftop Lounge recently brought award-winning chef William Artley from Washington DC, creating a modern-Mediterranean menu that showcases complex flavors and ingredients sourced from all over the world. The result is an experience worthy of special occasions, while still being comfortable enough for a casual dinner with friends and family. Chef Artley arrived at Castile Restaurant back in November, after many years of running restaurants and racking up awards. Among his numerous awards is Rising Star Chef and Virginia Chef of the Year. He has been a guest chef for the Beard House, and is only one of six chefs in the world to be a guest chef for the White House during the George W. Bush administration. The White House liked his work so much, they invited him back during the Obama administration. Since arriving here, he has formed a versatile kitchen staff with experiences from all over the world. “This is a really special team from the front of the house to the back, hungry to make every guest’s experience memorable. That is the art of hospitality, that's Castile Restaurant,” said Artley. Before sitting down to dinner, make sure you stop at the bar to try one of their sample cocktails like the Quemar la Casa. This is a smoking cocktail, literally! They start with Stranahan Whiskey, maple simple syrup, and orange bitters. Blend it over ice and strain it into a small glass flask. Wood chips are lit, and smoke is piped into the flask before pouring it over fresh ice. The smoke infuses into the drink and compliments the maple and whiskey flavors. It’s smooth, smoky and so delicious, I had to have two! Tuna ceviche at Kimpton Hotel Zamora's Castile Restaurant. The new menu includes items you don’t find at most restaurants on St. Pete Beach like Moroccan lamb, pork belly, whole branzino flown in daily from Italy, and Margret duck. For an appetizer, I recommend the tuna ceviche accompanied by an avocado and spicy cucumber sauce. The taste of the tuna is sublime and is the consummate base for the creamy, pepper-forward sauce. The presentation is just beautiful and the taste is even better! 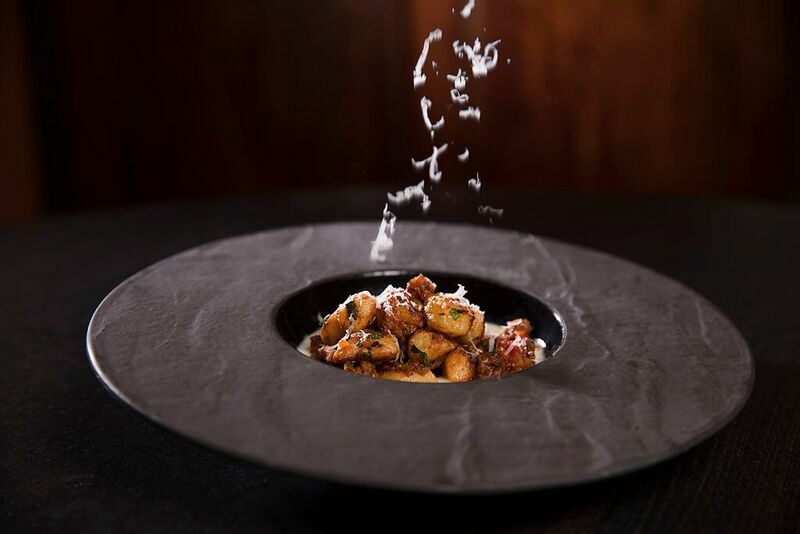 The wild boar bolognese features house-made gnocchi with a Manchego fondue. This a perfect marriage of textures and flavors. The gnocchi is so light and airy, Castile must have angels in the back making them. 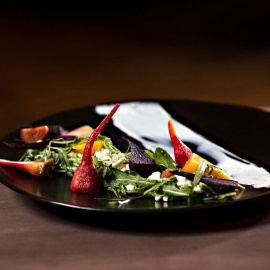 The salad of baby beets features a dressing of pomegranate molasses and minted yogurt. The beets are roasted for several hours in a salt-filled pan, causing the natural sugars in the beets to blossom and the skins to slip off. The hanger steak has a simple preparation but still delivers great flavor. 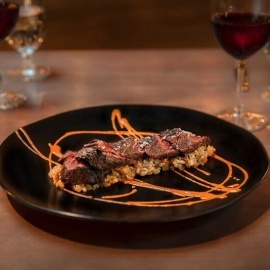 The cut of beef is rarely seen on menus because there are only two on each cow down the side of the animal near the kidney, taking on a lot of flavor. At Castile it gets marinated in olive oil with some fresh herbs, grilled to medium rare, and served with a bomba pilaf and red churri sauce. This perfection on a plate and I could eat this every week. There are so many interesting and unique items on the menu it might be hard to decide. But one thing is certain: you don’t want to miss dessert. Many area restaurants don’t have a dedicated pastry chef, but Castile does and it shows with an inventive menu of sweet treats. The apple pie is one example of a unique twist on the all-American comfort classic. This time it’s deconstructed and features an apple spice cake, caramel semifreddo, and crunchy apple croutons. It’s topped with a bit of whipped cream and minced Granny Smith apples. The chocolate mousse is served in an orange tuile with hazelnut dust and a cranberry reduction. They nailed the texture of the mousse, with just the right amount of cocoa to be a foil for the cranberry reduction. The tartness blunts the bitter creating the perfect taste to pair with the lush and silky mouth-feel. Tropical and local flavors take center stage in the coconut lime cheesecake and citrus pannacotta. In the constellation of places to eat on St. Pete Beach, Castile Restaurant & Rooftop Lounge shines with a new head chef and menu like the North Star. The food is sophisticated and artfully presented with complex flavor profiles worth the trip from anywhere in the Tampa Bay area. If their goal is to create memorable experiences, mission accomplished. For more of the best places to eat, drink and events in your neighborhood, check out 727area. Register for updates send to your mobile device and best of all, it’s free! 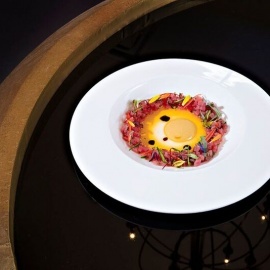 Top photo is wild boar bolognese at the Kimpton Hotel Zamora's Castile Restaurant. All photos courtesy of the Kimpton Hotel Zamora.